(Office of Her Majesty, Press Department - Amman) Celebrating the spirit of entrepreneurship among student youth across Jordanian universities, Her Majesty Queen Rania Al-Abdullah, on Sunday, recognized the six winning teams of the Princess Sumaya National Entrepreneurship Competition and placed the foundation stone for the Queen Rania Center for Entrepreneurship in the presence of Her Highness Princess Sumaya Al-Hassan, Chairman of the university. During the ceremony at the Friendship Auditorium of the PSUT Campus, Queen Rania distributed awards to the winners for their outstanding achievements throughout the competition's different stages. 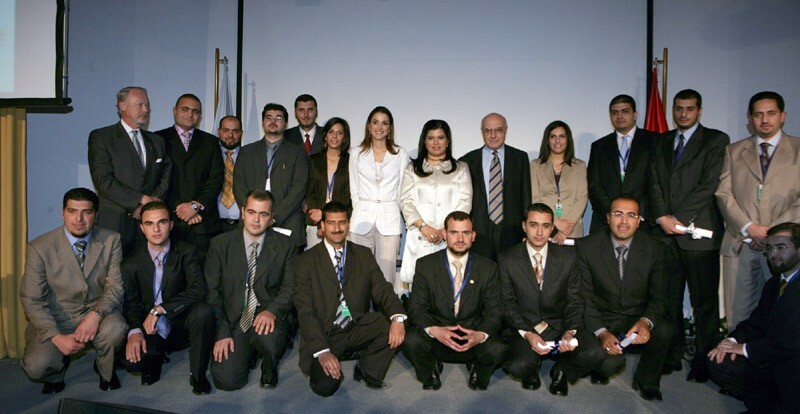 The PSNEC competition began in 2005, as participating student teams from different Jordanian universities were required to present a business plan for a technology based entrepreneurial project of their choice. The plans were presented before a panel of an internationally acclaimed judging committee that included experts from MIT, Cambridge, the King Fahad University for Petroleum and Minerals, Compubase, and of course PSUT along side other entrepreneurs and business leaders. Her Majesty also recognized members of the Judging committee for their efforts in addition to parties responsible for mentoring the students throughout the competition's final phase, and awarded them. Forty-two teams and individuals submitted applications to PSNEC last year. The committee of judges narrowed down the list to seven finalists, of which six teams were selected as winners. While at the University, Queen Rania placed the foundation stone for the Queen Rania Center for Entrepreneurship's (QRCE) at PSUT campus. Thanking Her Majesty for her presence and royal patronage, HRH Princess Sumaya said "I am so proud to see how the Princess Sumaya University for Technology has initiated this national program which will serve many talented Jordanians and will assist them in making their dreams come true. This first award ceremony has been an inspiration. It is both fulfilling and pleasing to see how capable students from different Jordanian universities teamed up and interacted so productively. In terms of the establishment of the Queen Rania Center for Entrepreneurship, this is yet another milestone in the development of our university and in producing innovative and creative citizens for a brighter Jordan. Academia and business today are much closer than they have ever been" Princess Sumaya also thanked private and public entities that had supported the competition. She especially thanked the Jordan Telecom Fund for sponsoring the competition. Commenting on the Jordan Telecom Fund's sponsorship to the competition Dr. Shabib Ammari Chairman of Jordan Telecom said, " In keeping with HM King Abdullah II's vision for growth in all sectors within the nation, we at Jordan Telecom constantly strive to take part in social and educational initiatives in Jordan. We always seek to cooperate with the people behind such noble causes, for together we will play an integral part in the nation's journey towards a future of further growth and prosperity”. Princess Sumaya also added that the Queen Rania Center for Entrepreneurship is a direct embodiment of a new entrepreneurial culture emerging in Jordan and will help encourage it's spread further; with the presence of such a center on the university campus, students will be more in touch with the resources and skills they need to expand both their levels of creativity, and their leadership skills, and with more young leaders in our society the Jordanian economy will prosper further in the years to come. Commenting further on the role played by PSNEC in shaping young Jordanians' minds, the board's deputy head Laith Al-Qasem said, " The PSNEC is not only a university competition, but rather a national initiative aimed at expanding the horizons of our students and at planting the true essence of entrepreneurship into them, for we firmly believe that the student's of today are the future of Jordan, and their ability to think creatively and productively will be the stirring force that will elevate our national economy to new heights. I would like to take this opportunity to thank our judging committee, our contestants, and all other parties involved in the PSNEC for without your efforts this event wouldn’t have been a success, and I would also like to congratulate our winners on their achievements. I look forward to seeing you all excel further in the business world" During the ceremony, a documentary film was also shown to highlight PSNEC made by DART; the student entrepreneurship society at PSUT. The film was shown as a means to highlight the role PSNEC plays in promoting the entrepreneurial culture amongst the youth of Jordan. This movie was shown along side other informative features making up the event's program.